North Korea, interest rates and an escalating ‘trade war’ have investors on edge. A pool of opportunities, however, might help them weather the storm. ON THE surface, it would seem like the perfect environment for investing in global equities. The economies in so many countries are performing well and unemployment rates have dropped dramatically. For the first time since the global financial crisis, the world is experiencing synchronised growth, leading many investors to believe that positive earnings are here to stay. But getting the timing right to avoid volatility is virtually impossible, and mistakes can be costly. Financial advisers can protect their clients’ investments by diversifying with new opportunities in global equities and staying focused on their clients’ long-term goals. “Advisers can play a really meaningful and valuable role for their clients in helping to maintain a focus on their long-term asset allocation, rather than reacting to short-term noise,” Mr Geysen says. “The markets don’t like uncertainty and investors should be prepared for a bumpy road. Keeping clients to their long-term asset allocation strategy can be critical to their retirement outcomes, but can also be one of the most difficult things to do when uncertainty hits. According to Stephen Miller, investment consultant at Grant Samuel Funds Management, the economic activity for the global environment looks strong. Indeed, 2018 is turning out to be the first meaningful episode of synchronised global growth since prior to the GFC, he says. “The US appears to have considerable momentum, European growth shows signs of increasing breadth with more positive growth readings from France joining the wellperformed ‘north’ led by Germany,” Mr Miller says. “Japanese growth looks promising, China maintains a promising clip while growth in the rest of the world takes on a broader hue with an increasingly positive backdrop for emerging markets.” But a positive outlook does not equal zero risks in global equities. “The foregoing global growth environment, foreshadowing as it does a strongly positive earnings environment, should therefore be strongly supportive of global equities,” he says. “However, after the extraordinary low volatility of years immediately prior to 2018, volatility seems certain to increase, which probably presages more performance dispersion between individual stocks and sectors, meaning that ‘stock picking’ becomes a more important attribute than may have been the case in recent years.” According to Mr Geysen, more than 80 per cent of developed markets around the world are at full employment, with jobless numbers expected to decline further in 2018 to multi-decade lows. Rising wages can lead to higher inflation, pushing central banks to raise interest rates sooner than later. Wingate Asset Management’s chief investment officer Chad Padowitz also has a reasonably positive outlook for the immediate term, but expects higher interest rates to have an impact on economic activity over the next 12 to 18 months. “In a sense, the further out you look, the darker the clouds on the horizon begin to look,” he says. Beyond the risk of rising interest rates, investors will also be watching how the market responds to a number of geopolitical issues, including an escalating “trade war”. The trade war started after US President Donald Trump announced tariffs on steel and aluminium. By early April, China retaliated, slapping its own tariffs on 128 US imports. Grant Samuel Funds Management’s Mr Miller says the concerns here surround the trade war’s impact on equity returns. “The fear is that they incite retaliatory measures from the major trading blocs, such as China and the EU, leading to a race to the bottom in terms of protectionist measures with an attendant slowing of global trade and economic growth,” he says. 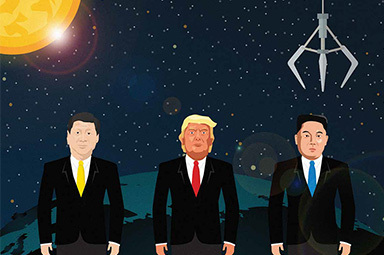 Mark Wills, State Street Global Advisors (SSGA) head of Investment Solutions Group for Asia-Pacific, says the current trade clash carries the risk that both the US and China could lose control of the situation. “One positive is that the US has referred the matter to the World Trade Organisation, which introduces an independent third party to the process. The US has a few strong options that they can use to affect China quickly. For example, tariffs have limited impact on them,” he says. Investors are also keeping a watchful eye on the potential for conflict with North Korea. According to Alex Wolf, senior emerging markets economist for Aberdeen Standard Investments, there is speculation that North Korea has achieved its goals around its nuclear and ballistic missile program, and now wants a meeting with the US President to negotiate recognition as a nuclear power. 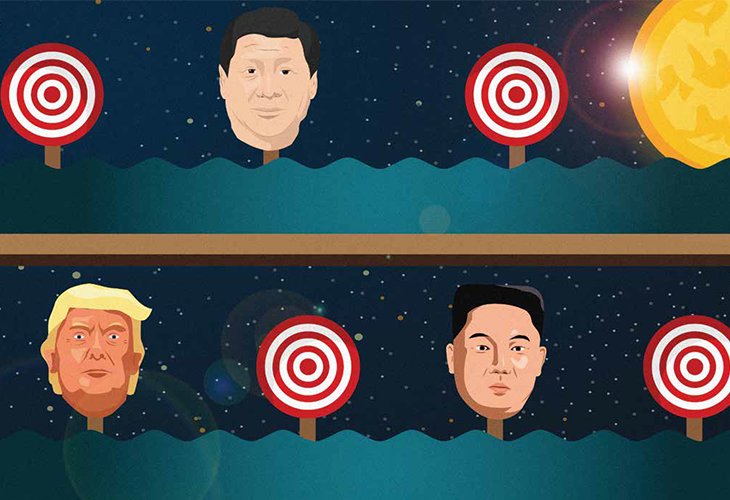 While President Trump’s meeting with Kim Jong-un this year is not expected to have a major impact on the markets, the outcome is still unpredictable, says SSGA’s Mr Wills. “No progress is not a bad outcome, as the world has tolerated the North Korean attitude for decades. However, whether Trump has the same level of tolerance is to be seen,” he says. “Trump’s new advisers are extremely hawkish regarding their attitudes about US interests. This suggests their advice to Trump will be to be aggressive towards Kim. Conversely, Trump remains a very instinctual leader who has been happy to ignore expert advice and follow his own thoughts. “This highlights why the outcomes of this type of issue are difficult to predict.” James Norman, head of equity strategy at QS Investors, predicts the meeting will be a non-event. However, what may bring about change is China turning off the petroleum taps flowing into North Korea, says Aberdeen’s Mr Wolf. “Over the past five months, China’s exports of refined petroleum have collapsed. The average over the past five months on an annualised basis equals roughly 3.7 per cent of last year’s exported amount, and the pace is on a downward trend, suggesting total exports could fall further,” he says. Despite the number of geopolitical issues, opportunities in global equities still exist. These include Europe, and the financials, energy and healthcare sectors, according to Peter Wilmshurst, research analyst and portfolio manager at Franklin Templeton Investments. Because Europe is only five or six quarters into its recovery since the GFC – about three or four years behind the US – there is still plenty of economic slack and room for economies and corporate earnings to recover, he says. Meanwhile, the European banking sector continues to make progress, Mr Wilmshurst adds, with earnings revisions returning to a positive trajectory. Demand for oil is also expected to increase, while the pharmaceuticals sector continues to be an inexpensive opportunity. “We believe the demand for oil will continue to increase over time in the medium term, despite rising adoption of electric vehicles, and many integrated oil names are set for record free cash flow should the oil price hold at $60. Capital expenditures and operating expenditures are broadly being cut across the industry and dividends are likely to be covered in 2018 with oil greater than $50,” he says. Wingate Asset Management’s Mr Padowitz also sees stock-specific opportunities in the healthcare space as well as in certain companies where he believes a cyclical risk is being mistaken for a structural risk. As an example, he points to media company WPP – Wingate’s largest position. “Regulated utility businesses, post the sell of longer dated bonds, are also looking increasingly interesting, given their consistent cash flows and they’re likely to outperform if the broader market comes under further pressure,” Mr Padowitz says. Lazard Asset Management portfolio manager Warryn Robertson would also agree that opportunities in global equities are limited due to high valuations. While it is possible to construct a portfolio of global equities to generate a reasonable return, investors need to be more selective, he says. Attractive companies are those with characteristics that include market-leading positions, a long history of stable financial returns, relatively low leverage, and large and sustainable competitive advantages, which make their earnings more predictable than most, Mr Robertson says. “While we think these companies are well placed for the environment we face today, valuation is going to be critical. A good company bought on the wrong multiple can still be a bad investment,” he says. Despite these bright spots in global equities, it is impossible to predict which sectors are immune to market volatility. In other words, safety is not guaranteed, which is why diversification is so crucial. “It is impossible to adequately forecast each and every event that may have an impact on portfolio returns. So, the right balance is a balance between risky and defensive assets in a portfolio [and] remains a primary consideration,” says Grant Samuel Funds Management’s Mr Miller. “However, given what else is occurring in the global economy and the risks to global equity returns from other sources, perhaps another consideration is to reduce exposure to both bond and equity beta and look at introducing total or absolute return strategies into portfolios. Lazard Asset Management’s Mr Robertson also believes investors should have a greater focus on absolute, rather than benchmark-relative risk. He says all investors need to actively consider the current market and geopolitical backdrop when making decisions. “We believe these risks could have an impact over time and this may result in greater spread between winners and losers. Over the past nine years, investors have earned strong returns simply by being in the market. Beta returns have been healthy enough that alpha became a secondary concern. But now asset allocators must be prepared to be very different in order to protect capital and earn acceptable returns,” he says. When it comes to dealing with the noise of geopolitical issues, SSGA Investment Solutions Group’s Mr Wills says financial advisers and investors should be wary of commentators who make definitive projections or have opinions that rely on personal views that are not strongly rooted in facts. “Many issues and their outcomes are simply not knowable. Trying to opine on the outcomes from the clash between China and the US over trade is virtually impossible. Monitoring milestones and staying on top of a situation is possible, but predicting outcomes is largely a fool’s errand,” he says. Meanwhile, Wingate Asset Management’s Mr Padowitz finds there is limited value to be gained by speculating on geopolitical issues. “In terms of our find, we will spend much more time on the fundamental prospects of the companies we own. We cannot control the outcome or trajectory of geopolitical events,” he says. As for what financial advisers can do, Mr Padowitz suggests they maintain their primary focus on meeting the needs and objectives of their clients. “A clear understanding of your clients’ investment horizon, objectives, needs and risk tolerance will add much more value than an educated guess on geopolitical machinations,” he says. This is also what QS Investors’ Mr Norman thinks, saying that financial advisers and their clients should create a strategic plan and stick to it – regardless of geopolitical noise. “Equities are the best long-term growth opportunity, and the best way to realise long-term investment objectives is time in the markets, not timing the market,” he says.